The historical project of the Enlightenment failed. Lights do not work at all. Oops is a solo dance performance enacted as a continuous “dialogue” between the dancer (Anita Wach) and the stage, which keeps questioning the meaning of the performer’s and its own existence. The stage takes on the role of a “dramatis personae”, addressing the audience and the dancer by way of a projected text: I’m having trouble with the lights. I know I should turn them on any moment now. But I am afraid that this could be a mistake. Even though the stage speaks from a position of a timeless consciousness, a transcendence, “critical reason”; even though it is perfectly aware of the historical loop of mistakes in which it gets caught up over and over again together with the artists, produces, audience, economy, the state, science, religion – it is completely powerless, condemned to the physical presence of the performer. The dancer, trapped in her own physical presence and at the same time a captive of its context, can only defend her own meaning through her body. Both set a limit to each other and both are forced to admit to each other how every time anew they manage to betray each other. Mistake is the only meaningful reason for their existence. Oops addresses the mechanism of the mistake, which acts as a noose from which there is no escape. For there is never just one mistake. It is always followed by an endless series of mistakes, until the need for change becomes too great. You change your dress style, or eating habits, your partner, job, name, address, bank, director, marriage, president, government, constitution, system… Life becomes an endless process of correcting mistakes, revolving around the repetition of one and the same mistake – to correct the mistake. History gradually loses its meaning. “Enlightened reason” got stuck at the court of King Louis XIV, cynically condemning every attempt to reach a solution to failure. It has become the captive of the mistake. Anita Wach is dancer, choreographer and performer. She was a dancer in one of the first dance companies in Poland, Silesian Dance Theatre (Bytom, 1996-2003). Since 2005 she works mainly with Bretoncaffe Theatre (Warsaw) and collaborates with various artists as an independent performer and dancer. Bretoncaffe group members are concentrated on searching for a new method of body work and creating new dramaturgy of movement. She was a resident in Pact Zollwerein Choreographic Centre (2005), a scholar of Pro Helvetia (2003) and Polish Ministry of Culture (2011). She took part in several international projects: interdisciplinary KonglomeArt (Berlin 2003), the improvisation project Blind Date and video- dance project (both polish – izraeli cooperation, 2008). 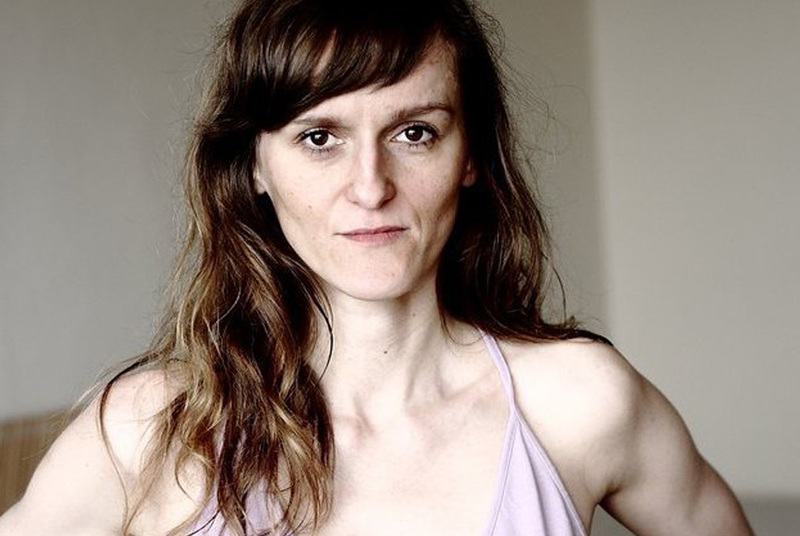 In 2010 she started collaboration with Via Negativa as a performer in two projects directed by B. Jablanovec: Casablanca Therapy (2010) and Shame (2011). She is also an author of three dance performances: Inch 1,5 – solo performance (2006), improvised –solo work on/off (2010) and syncretist duet weast.com (2009). She is teacher of dance and yoga in Warsaw. Bojan Jablanovec is theatre director, founder and artistic director of the Via Negativa project. He graduated at Ljubljana Academy of Theater. From 1993 to 1999, he directed in most Slovenian theatres. From 1997 to 1999, he lectured as an assistant/trainee at Academy of Theatre Ljubljana. In 1999, he stopped directing in Slovenian repertory theatres and dedicated himself to theatre research. He mainly focuses on formation of a process, which effectively brings a performer to his authorial creation – so as to become a performing artist, who stands on stage with his own declaration, with his own body in meaning. In 2002 he founded Via Negativa, an international contemporary performing arts project. From 2002 until 2008, every year he and his co-creators focused on one of the seven deadly sins (wrath, gluttony, avarice, lust, sloth, envy, and pride), as a basic trigger for actions on stage and relationship to the audience. Jablanovec is above all interested in theatre as a medium of communication rather than aestheticization. Using a reduction as working method, he focuses on the relationship between the performer and the viewer, and on the question of the real in this relationship.